Warwick and Warwick sold a section of the famous Karl Jaeger postcard collection on 18 November and report that 96% of the lots were sold, the vast majority at figures well above estimate. Although Karl saw the auction catalogue regrettably he died before the sale took place. His famous chronological world collection was sold volume by volume. The 19 lots were estimated in total at £10,670 and realised £13,393, including the buyers’ premium. His foreign country collections comprised about 60 lots, of which U.S.A., where Karl was born, formed 8 lots, with estimates totalling £1,675. They realised £3,805. Other popular areas were Central and Southern Africa(3 lots estimated £680, realised £1,616),Central America and West Indies(3 lots estimated £460, realised £1,451),China(5 lots estimated £1,320, realised £2,088) and Japan(3 lots estimated £1,010, realised £1,722). Advertising formed the largest section of Karl’s subject cards. The 5 lots on offer were estimated in total at £950 and realised £1,840. Five collections of politics, including political satire, estimated at £1,520, made £2,366. 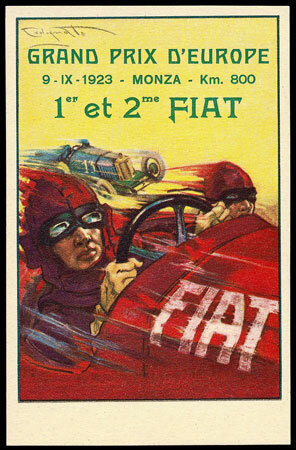 Aviation, road transport, motor racing and glamour were all popular. This superb poster advert for Fiat cars made £94. 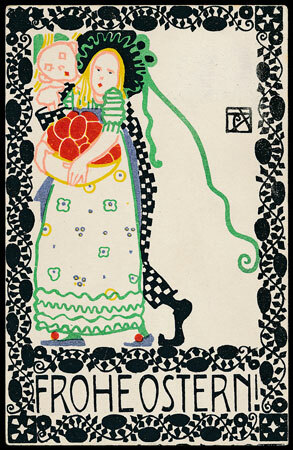 Karl appreciated continental art postcards and especially the Wiener Werkstaetter designs. This Mela Koehler card achieved £448 and another by Maria Likarz-Strauss made £306. Karl’s Great Britain lots were rich in social history and this accounted for their popularity. A collection of Brighton estimated at £230 realised £649. 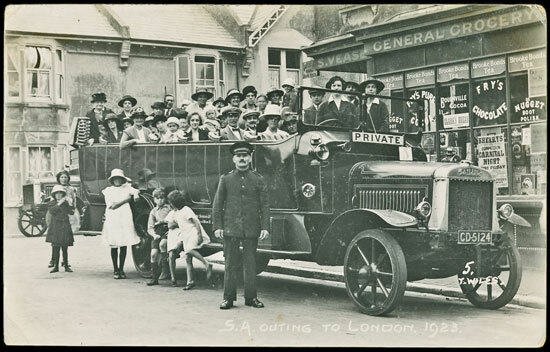 It included this delightful RP of a 1923 Salvation Army outing to London. A further section of the remarkable collection formed by Karl Jaeger will be offered by Warwick and Warwick on 20th January 2016. The sale was not a single vendor sale however and the highlight towards the end of the catalogue was an RP full length portrait of Captain E.J. 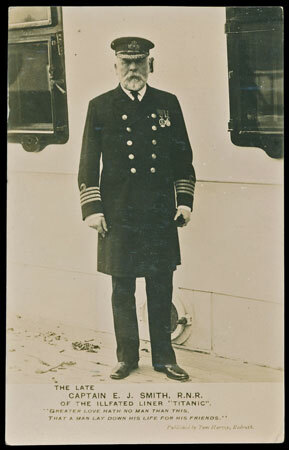 Smith, master of the “Titanic”, which sold for £413.